German Valley United Methodist Church, the lovely white church that sits on the corner of Church and Main Streets in the small town of German Valley, Illinois, is a sustaining force in the lives of its members and their families, the neighborhood, and the surrounding rural area. The church began in the early 1900’s with the building being erected in 1903. So for over 110 years this United Methodist congregation has worshiped together, grown together, struggled together, and survived together as a loving family of God. As a church we serve our community and the surrounding area, its families, friends, and neighbors. We feel our worship style offers something for everyone, at any age or station in life. Children are welcome and encouraged to attend and participate in our worship experience. Young people to our seniors also participate each week with music, greeting, and helping by lay reading the scriptures during worship. Greeting our visitors, neighbors and friens with God’s love and peace creates a family bond showing our love and concern for each other. Those loving and compassionate moments are what sustain and hold us up during the coming week. Our pastor’s weekly children’s time speaks to the young and young at heart as well. God’s message he brings every week is inspiring and uplifting, full of love and compassion for all of God’s children. Visiting and caring for his flock is an important part of our pastor’s ministry. 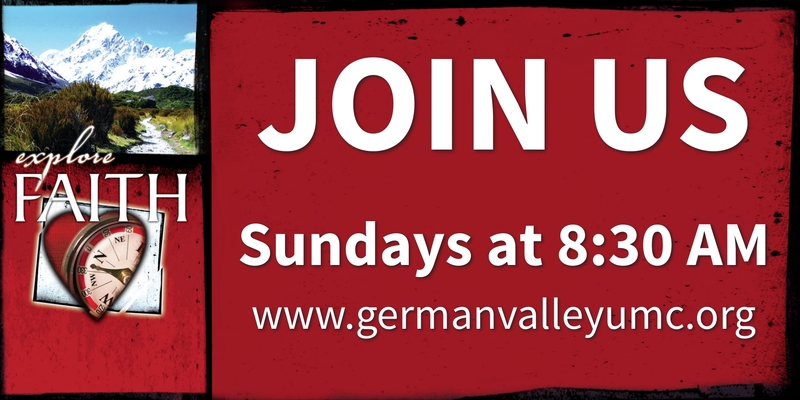 Come see a slideshow of our wonderful community, and get a glimpse of some of the many activities that take place at German Valley UMCSunday Worship.